How do I back up Google Authenticator? I'm starting to use Google Authenticator for more and more things now, but I've just realized that if I lose my phone, or if I need to wipe and restore it to install new firmware, I will lose all of my codes. Is there anyway to back them up please? Or some kind of fallback that means I can restore it to a new device? The following method will only work rooted Android devices. Note that the folder on the PC has to already exist. This will copy the authenticator database files with the main keys, from which the One Time Passwords are generated, to the PC. The file can then be restored to the same location, on Android devices, or read with an sqlite database viewer to extract the keys. You don't need to back up the Google Authenticator app/data as you can create a list of 'Backup codes' which you can use to log in without requiring a authentication code on the same page that you configure 2-step authentication. Why print or download backup codes? Backup codes are especially useful for people who travel, have problems receiving SMS or voice calls, or cannot use the Google Authenticator mobile app. Store these in a safe place (or print them out) and if you lose your phone you can use one of these codes to log into your account and set up a new device with the Authenticator app. Titanium Backup (link to Google play store) will backup any android app, including Google Authenticator. However, you must root your phone for this to be a viable option. I would also recommend printing the Google backup codes too. This isn't quite backing up the Google Authenticator app, but they would allow you to reset the authenticator if necessary. This would only help for regaining access to your Google account though. Backing up the app with Titanium Backup is the most complete option, in my opinion. It's saved me on a number of occasions. It turns out that original tokens (usualy represented to the user as qrcodes) are stored in sqlite database inside /data/data/com.google.android.apps.authenticator2/databases folder and can be extracted from the device. This project extracts original tokens, then generates a web page with qrcodes you can rescan on a new device. 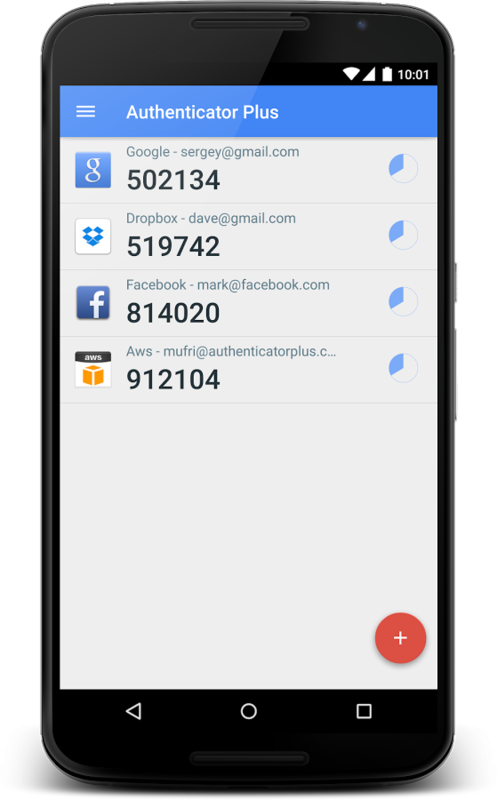 Try Authenticator Plus, it supports backup/restore functionality with sync across devices, if you have a phone/tablet, this app syncs all accounts between them flawlessly, it even support Android wear. The easiest way to handle this is to take a screenshot of the QR code whenever you setup a new Authenticator for a site and save it in an encrypted location. Before you negativoids say this won't work, yes it does, and you CAN have the same Authenticator on multiple devices. You can save the QR codes when you setup or renew your 2FA. You can save the QR by making a screenshot. Or using the context menu 'save image as' but this is not always available. (Make sure to give the images a corresponding name with the account and backup in a secure location). For restoration just rescan the QR codes in Google Authenticator. As a preface this is an approach for configuring MFA ahead of time so that it is always backed up, not recovering or backing up existing codes. I just went through this process after my Nexus 6P stopped connecting to data and I had to setup all my MFA again on a Pixel. I realized that if I lost my phone or did the factory data reset I'd have been totally borked. The simplest solution I came up with is to ignore the QR code based setup and just use the token based setup itself (it's the "manual" option in most authenticator apps). Every service I've used so far allows you to opt for the token-based setup rather than QR. I verified that you can setup clones of the authenticator using the same key on independent devices running simultaneously. Thus, so long as you securely control the tokens, you can configure MFA on any device. I'm satisfied with this result as I didn't have to do anything more than reconfigure MFA (I had to do this anyway in my circumstances) and simply add all the tokens to lastpass. Now I'm covered in the case of phone loss and can configure other devices if need be. There are a lot of advice for rooted phones. But it isn't recommended to root your device if you don’t want to make it vulnerable. Two-factor authentication provides an additional layer of protection and by rooting you bring it to naught since different viruses could get an access to protected memory areas. Only small amount of services offer backup codes (particularly Google). For these services, you should save backup codes. The best solution is to save the QR codes (or the secret keys) in the moment of token enrollment and keep them in some safe place. Then if you lose your phone you could restore tokens in Google Authenticator on your new device. Also, you can use hardware tokens. They can be in the form of key fob or credit card. Have a look at this article on the blog of Protectimus (the company where I work) to get more information how to backup Google Authenticator: How to Backup Google Authenticator or Transfer It to a New Phone. * Disclosure: I work for the website linked above. The following method will only work on rooted Android devices. This method is more useful for the not-so tech savvy people or the people like me > who don't want to waste time installing Android SDK + JDK from scratch just to run the adb command. Download and install any "Root explorer" app from Google Play store. I use the popular and free FX file explorer with its free FX root access addon. You can use others too. This app makes it possible for us to access the Android system as a root user. Once you open the file explorer in System root > Click "data" folder > Click "data" folder (inside the other data folder) > Copy the folder named com.google.android.apps.authenticator2 > Exit System root folder > Open normal Main storage / SD storage space and Paste the Folder here. Connect your android device to a PC and Backup the folder to a secure USB / external HDD. That's it. Now, whenever you need to reinstall your firmware/ buy a new phone just follow the steps above and copy that folder to the exact same directory once you've installed the Google Authenticator app. OR, you can use a free Open source SQLite GUI editor like "SQLite Database Browser Portable" to open the "databases" file inside the "com.google.android.apps.authenticator2" folder. In the "Browse Data" tab, you can see the key and name corresponding to the key so that you can manually enter the key into the Google Authenticator app. On a rooted phone you can use the "Amaze" file manager (https://play.google.com/store/apps/details?id=com.amaze.filemanager&hl=en). Go to the root /data/data/com.google.android.apps.authenticator2/database directory. Open the database file as a database. Select accounts. You will have 3 columns _id, email, and secret. Copy the "secret" value. When you need to restore just add, select "Enter a provided key", give it a name and paste in the value. As I have experienced same just some time before. When you would be signing in to your account you will get page for key to put 6 digit code. At this place you can change second key and get in phone number if you have any number verified already. And for more backup you can choose an other computers as trusted. So, they won't ask second step code on those computers. You just paste your code and run them in Python environment. your code instead of "csnji4rfndisoh323fdsioah3u2iodso"
For other services - like described above. Not the answer you're looking for? Browse other questions tagged backup google-authenticator or ask your own question. How to migrate accounts to new Google Authenticator app? What happens with configurations and app data, practically, if I mod my device with custom firmware? How can I back up files from LG's Browser? How does Whatsapp store the chats and contacts of any given user, and are they recovered if one installs Whatsapp on a different phone?